Have you ever tried typing with waterproof plasters around two digits? That strange splint-like feeling where you’re reduced to using rigid digits to strike keys means things happen more slowly than usual. I know this because as I type this post the thumb and index finger on my right hand are immobilised in this fashion. This was a small wood-cutting accident brought on by my own willingness to be helpful. It doesn’t hurt... cut deep enough and the sensation just ceases. It’s just numb and immobile. Having an accident brings me neatly onto the course I’ve been on for the past week and one of the lessons I’ve learnt that will inform my practice as a technical author. The documentation I’ve been working with this week is all to do with the processing of explosive munitions and it makes for very interesting reading. The weight of legislation in this sector is immense, and the requirement for good documentation cannot be understated... and what is considered ‘reasonably practicable’ is still more dangerous than many other activities. For this reason facilities have hardware and accompanying policies and procedures in place to deal with everything up to and including lightening strikes, and it would appear the level at which they cease documenting and planning is up somewhere between ‘tornado’ and ‘meteorite impact’. This is also reflected in the precision of the documentation. That being said, the subject matter is still high explosives and there are always going to be risks, which is why the focus is on ALARP and not total elimination, which would see this industry unable to function. When I consider the main business of Clearly Stated, I can see ways that we apply the ALARP principle to our business practices. Clients’ documents are protected against fire, power and system failure, and flood. We use a good quality virus checker for everything. But there are potential events (like alien invasion) that we just can’t plan and prepare for. I am also going to use ALARP as a principle when authoring, considering the risks encountered by the end-users of my documentation. Is it reasonable to expect the users I’m writing for to ‘experiment and play’ with a system, and can I allow for this in my authoring in order to reduce the risk of them or the system getting stuck? Do users need a lot of hand holding? Well, again that depends on the anticipated user and the system, but I am also conscious that ALARP-friendly documentation may not cover every eventuality (like alien invasion) in favour of practicability. This brings me back to the damaged hand. Yes, I cut my hand, but the axe was necessary in order to have a nice warm fire going to keep me warm during dinner. An ALARP-friendly axemanship manual wouldn’t say, “Don’t swing the axe”, but it would have a section on the application of plasters and dressings! Alison’s desk, featuring two portrait monitors and a smaller offset display. Part of the fun of working for Clearly Stated is being able to specify (within limits) the hardware that I use to do my job. I’ve got two widescreen Iiyama monitors (the reason for this particular link is that we’ve been buying from Continental Monitors for some time now, and their customer service and pricing is brilliant) that I have set up in landscape view at eye level, forming a wall of images, documents and data when I’m working. 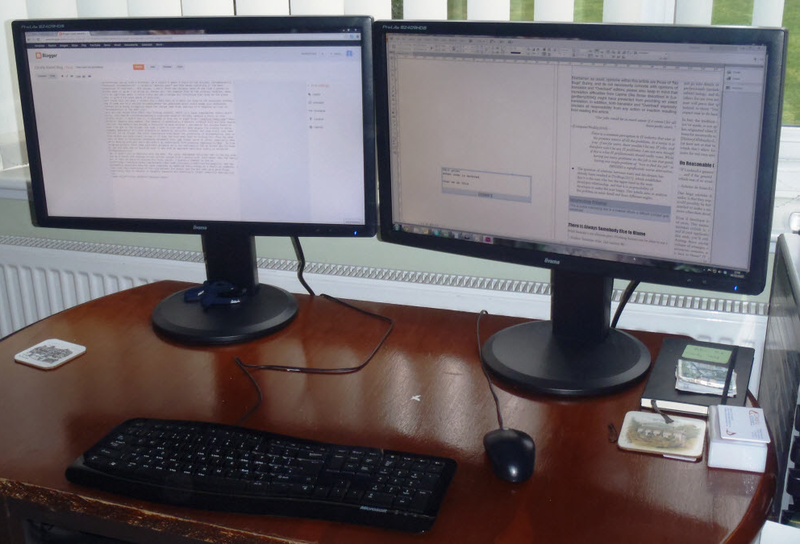 Alison uses three monitors, two of the same Iiyama model in portrait mode together with a regular Philips monitor offset to the left for dealing with graphics, timetables and emails. The speed and efficiency this lends to a technical author dealing with multiple images and documents at the same time is fantastic, as it saves having to constantly flit backwards and forwards between different windows, or finding that the drawing toolbar in Framemaker has decided to hover directly over the document being crafted. 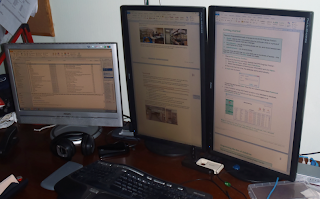 With multiple monitors a technical author can fly. My desk featuring two landscape monitors. It hasn’t always been like this though. In my last post with the Royal Air Force of Oman, I was responsible for authoring a language textbook. This was a full colour, illustrated affair, and my employer had very nicely paid for a top of the range Mac, together with InDesign and Photoshop CS5, and as the geek on the team (there were other authors, but no-one else willing to play with the new software) it was my job to turn stuff into a presentable textbook. For about two weeks we cantered along at a reasonable pace, and then it happened. I was picking up toner cartridges from the facilities office when I saw – gathering dust – a 15” TFT monitor. I expected to have to plead, and maybe even grovel a little bit, but I was assured that “this computer doesn’t work anymore” and was allowed to take it by quizzical but helpful staff. 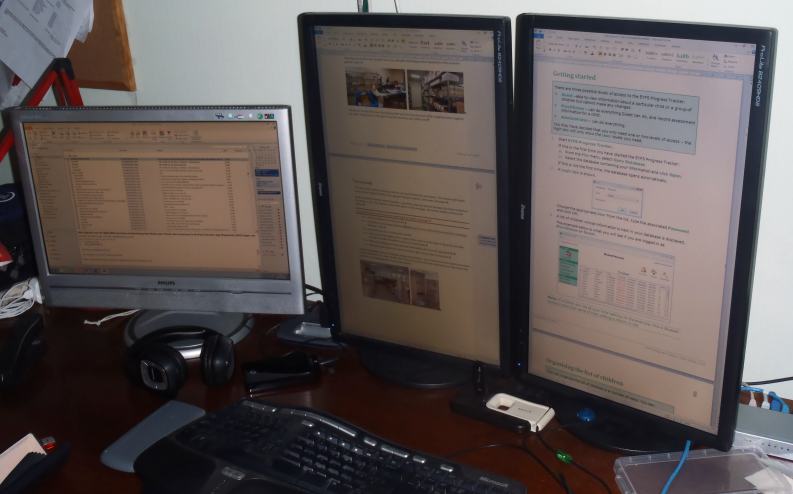 Two monitors! I was rich! I was flying! There was a display for graphics, images and source documents and another for the finished item... but my boss didn’t like it. It meant that I had a wall up, and from his perch on the far side of the room, I was concealed by a parapet of screens. My work-rate went up and the distrust diminished, but I do think the guy had a point. From the back multiple monitors do form a barrier, and it’s important to create an office environment where nothing is “hidden”. Many years ago, I had my own radio show with WONB. It was great fun, and I still have the ability to write copy that takes exactly 30 seconds to read out, amazing memories and a fairly eclectic knowledge of music pre-2003. Listeners used to phone in and sometimes send letters or cards. One old man sent a nice card after I’d played a song that reminded him of a girlfriend from the 60s, whereas others would request songs or phone in with jokes and comments on the day’s news. The fact is, with any broadcast medium – and I’d include blogs and technical documentation in this category – the audience for our message remains largely unknown. There is therefore an inherent danger in these little glimpses into our audience. In the case of the old man who sent me a card, I had to consciously resist the desire to play all the songs he would like and ignore the silent majority of listeners. Similarly, although one esteemed friend from Pakistan has identified himself as a reader, and Google tells me I have readers from a host of different parts of the world using a variety of browsers (hello to all those reading this from France! ), I am resisting the urge to write for him or any of the others I know are reading this blog. Instead I write for the generally educated reader, who has some curiosity about the working life of a technical communicator. This brings me nicely onto the subject of analysing readers. I’m sure many of us have had the opportunity to meet a selection of end users, particularly when working on internal documentation or planning a training course. Although valuable, I feel this experience should be approached with caution, primarily because I’ve often been the guy who’s been nominated to speak to the “special visitor”. The fact is that unless the client’s business is staffed by Oompa Loompas, or the Borg, the individuals you meet will be probably be outliers. The same happens when shooting TV commercials. A company that uses its own staff rather than actors in commercials may still choose their more attractive staff or those who represent the aspirations of the company rather than the reality. How can you tell whether the people you meet are outliers? First, look at the room where you're meeting them. Does it resemble a scene from Mary Poppins, or Columbo? If there are cakes, biscuits and drinks available then you may be talking to the cream of the crop who’ve been given a “bit of a treat” by the boss; alternatively if the room is bare apart from a tape recorder and a panic button, you could have been given someone from the bottom of the pile. The other way is politely enquire, “I do hope this isn’t taking you away from anything else important?” If they respond that it’s just a normal working day and they’re pleased for the break, then this is a good sign... if the suspect person helping with enquiries explains that today’s the day the entire office was due to abseil down the side of the building in aid of a children’s charity, then you’re either faced with an above average “job comes first” individual, or the one who’s rarely left alone with his own thoughts and shoelaces, much less climbing equipment. Despite these observations, what you learn from the process will be valuable. These observations serve to temper and qualify the data collected and ensure you are broadcasting a message, not unicasting.